One of the sponsors I met during BlogHer ’10 was Avery Dennison at the Social Luxe Lounge event. They contacted me recently about hosting a back to school giveaway featuring a gift basket (similar to the picture below) filled with Avery Dennison supplies such as NoteTabs, hi-liters, glue sticks, binders, and more. As you know, with school cutbacks many teachers are forced to either spend their own money on supplies or go without. In fact, studies by the non-profit organization World Vision show that teachers spend an average of $500 of their own money each school year on supplies. Avery Dennison is helping out with their “Avery Celebrates Teachers” sweepstakes. Encourage teachers (including homeschooling parents) to apply soon as the sweepstakes closes on September 15, 2010. Read the complete rules for more information on requirements. Encourage teachers (including homeschooling parents) to apply soon as the sweepstakes closes on September 15, 2010. Read the complete rules for more information on requirements. You can also support schools through Box Tops for Education. 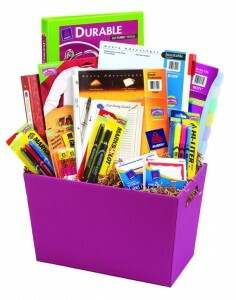 Avery is the only school and office supply manufacturer that participates in this program. When you purchase select Avery school supplies for the new academic year you also receive Box Tops coupons to clip and return to participating schools to be redeemed for cash. Each school then uses the cash at their discretion to purchase new supplies, fund programs, or buy much-needed equipment, computers, etc. To learn more, visit www.avery.com/btfe. There are four ways to enter the giveaway. For each entry, complete the form (click refresh to get it back). Comments left on the post will not be entered. 2. SUBSCRIBE: Subscribe to Buck$ome Boomer and complete the entry form saying you subscribe. 3. TWITTER: Tweet the giveaway and complete the entry form (no more than once a day). 4. BLOG: Include the giveaway in a post on your blog linking to this article and complete the entry form. This giveaway is open to those 18 or older and U.S. residents only. Entries close on September 6th at noon Pacific Time and the winner will be selected via random.org. If there is not a response within 48 hours to request for mailing address another winner will be selected. Remember to leave an email address that you’ll be checking. NOTE: I didn’t receive any compensation for this post other than the opportunity to give the gift basket to one reader. My favorite way to save on back to school is to shop the store sales in July. It helps that I’ve been shopping BTS for several years, because I know what the best prices are. BTS shopping can be tricky, but I try to catch deals throughout the year and at the end of the season. Lolli and Danielle, the form wasn’t working when you left your comments so I entered them in the form. Good luck on the drawing Monday! Previous post: What’s the Definition of Needs?